Weekends are more enjoyable for CIBC Tim Hortons Double Double Visa Card holders! 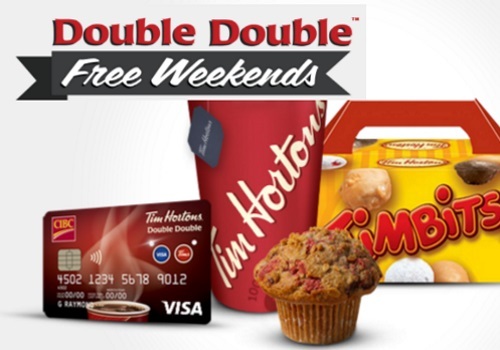 Get a Free Tim Hortons product compliments during their Double Double Free Weekends! Each month there is a new "Free coupon" offer, March is a cookie, April is a donut, May is an Iced Capp and June is a 10 pack of Timbits! (when you spend in that month, get that month's treat free the following month).